As announced earlier, we are changing our firewall strategy and will soon merge Emsisoft Internet Security with Emsisoft Anti-Malware, effective as of our next release in October. Instead of developing our own firewall module, we’re going to rely on the built-in Windows Firewall core that has proven to be powerful and reliable. Its only weak point is the fact that anyone can freely change the firewall configuration. In other words, if malware manages to run on the PC with sufficient administrator permissions, it’s able to allow itself to get through the firewall. 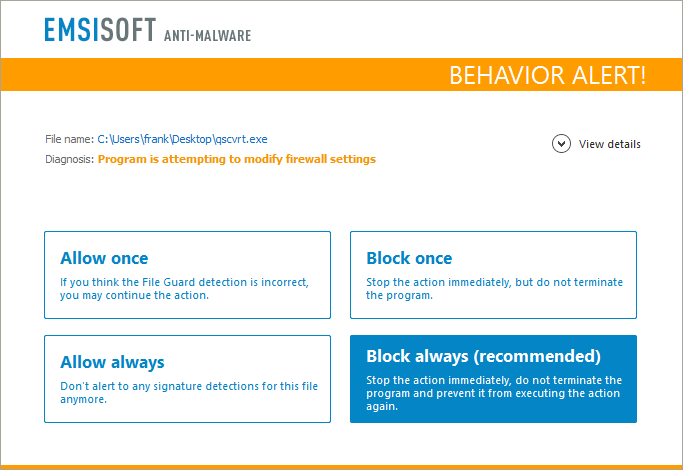 New: Firewall Fortification feature that blocks illegitimate manipulations of Windows Firewall rules. Fixed: Rare program freezes on opening the forensics log, confirming of surf protection notifications and during malware detection. Fixed: Computer restart instead of computer shutdown executed, when set for a silent scan. Improved certificate handling to avoid connectivity issues. New: Forensic Log: A condensed timeline that shows all events and user actions in an easy to read form.